Last weekend I took over @annlovesboston‘s Instagram stories. They’re a new Instagram account created for the Boston area stores and I was originally going to share my typical fitting room reviews but I challenged myself to try a more styled approach. This olive tie sleeve sweater with tan utility pants is the second of two outfits I shared for the takeover. If you missed the stories you can watch it at the end of this post since I just uploaded it on YouTube. You can see the first outfit I shared in my previous post – Military Inspired Jacket. These tan pants are my first pair of utility pants. I was afraid to get them since I thought I wouldn’t reach for them much but I am surprised by how many tops I like with this more casual pant. 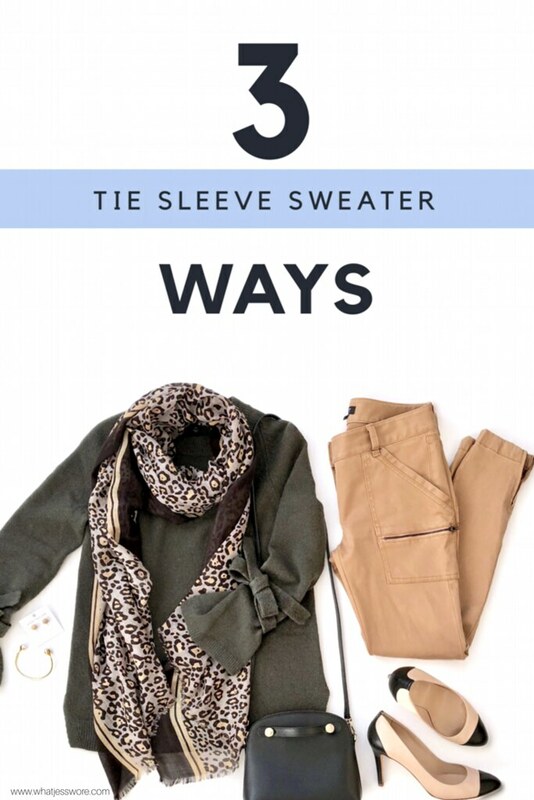 For example, these pants look great with this mockneck sweater and this shoulder button blouse. 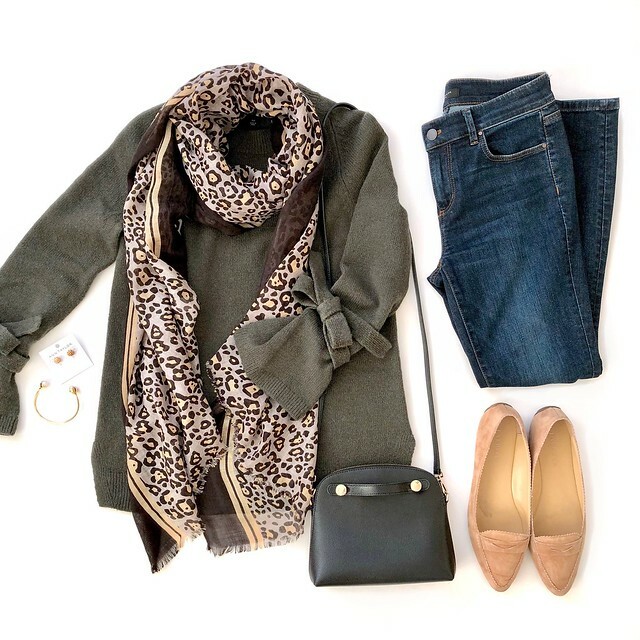 This outfit is one of my favorite fall looks because the leopard scarf highlights the tan colors of the pants while adding a pop of pattern to this neutral outfit. 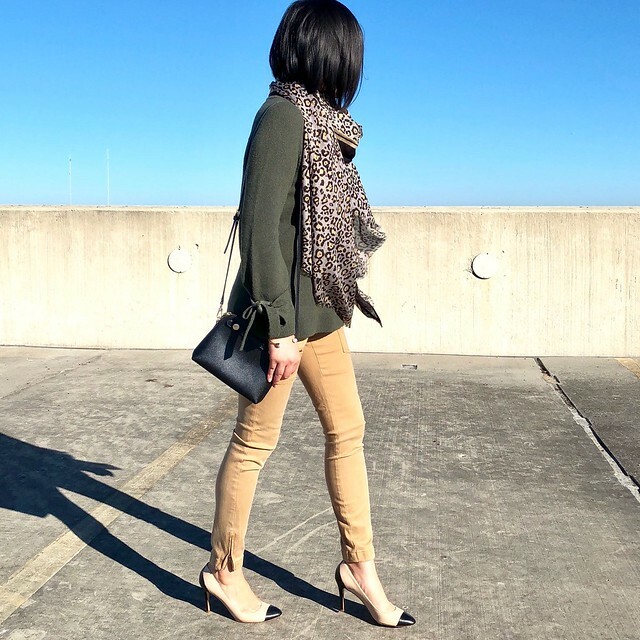 I completed the first look with the cap toe pumps to elongate my legs since I’m only 5′ 2.5″. For a more edgy look I switched out the utility pants for black leggings with sleek ankle booties. 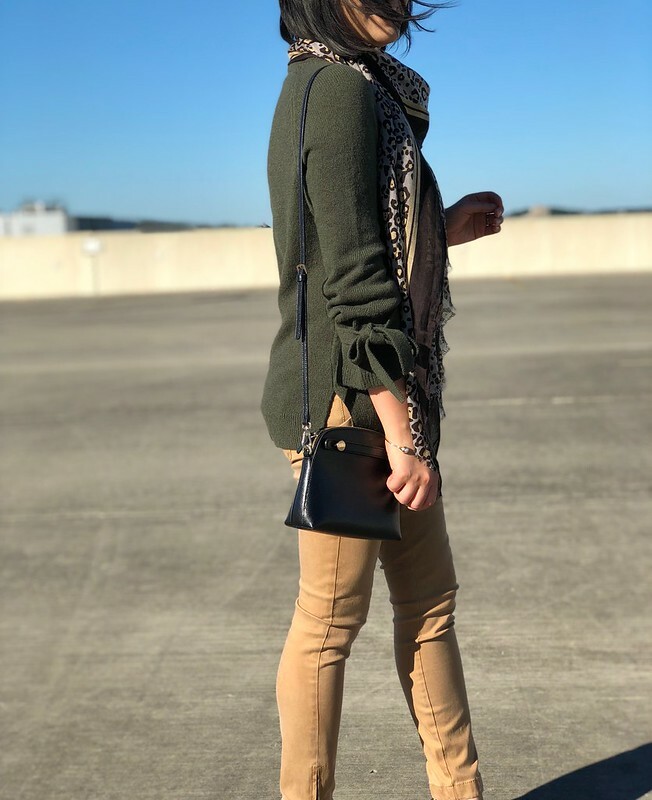 As a slight variation, if you prefer a more casual but still put together look then you can exchange the booties for a pair of chucks. Lastly, jeans and flats are an obvious choice for casual comfort. 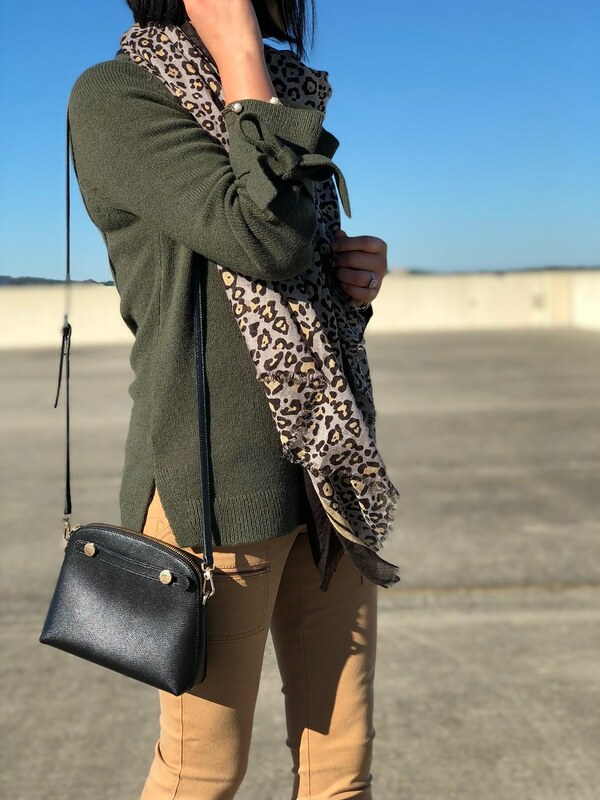 If you don’t like leopard print then you can take out the scarf since the tie sleeve sweater is very chic in its simplicity and easy fit. If you liked this post please consider repinning the following image on Pinterest. Ann Taylor – Get 50% off everything. Use code FALLFAST. Valid in stores and online. Sale ends 10/10 at 3AM ET. LOFT – Get 40% off everything. Use code FALLFEST. Update 10/7: Get an extra 60% off sale styles. Since no code is needed for the sale markdowns cardmembers can use code LOVELOFT30 for an extra 30% off*. Valid in stores and online. *Note: You may not see the extra 30% off reflected until you enter your credit card’s security code when reviewing your order and before you click on the ‘place order’ button.